3D Walkthroughs and 3D Renderings are not only effective tools for the sales and marketing of new property developments. Interior Designers, Home Theater Specialists, Kitchen and Bathroom Re-Modelers and General Contractors are all starting to utilize 3D technology as sales and marketing tools as well. 3Dwalkthroughs.com has witnessed an increasing number of home improvement vendors wanting to use 3D technology to present very realistic options to their clients as a way of closing a sale. An example of this would be for a Home Theater installation company to measure a room and then present a very realistic 3D Rendering of the finished product showcasing the specific audio/video components they represent. Another example might be for a Kitchen/Bath Remodeler showing a very realistic finished bathrooom with the specific bathtub and vanity products that they sell. As 3D technology continues to become more affordable we believe that it will be utilized in almost every industry across the board. iTouch – The New 3Dwalkthroughs.com Business Card? The Apple store on 57th street in NYC was lucky enough to receive a large delivery of iTouch units 2 weeks before they were supposed to be released. Braving the lines, even first thing in the morning on a Tuesday, I picked up a 16GB unit. Many of the features are similar to the iPhone except for the phone capabilities and integrated camera. 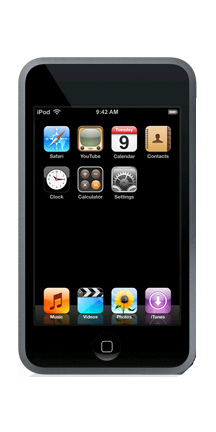 On a positive note, you do not need any kind of calling or wireless plan to utilize the iTouch. The downside to not having a plan is that you only receive an internet connection if you can pick up an unsecured wireless network. Much like the iPhone, 3Dwalkthroughs.com views the iTouch as a valuable tool to demonstrate our products. I have already loaded a whole bunch of 3D Walkthroughs, 3D Renderings and 3D Floor Plans onto my iTouch. It will be very convenient to pull out an iTouch during an imprompteau meeting and effectively show our products. I am sure we will experience more cool features over the weeks to come. In the meantime, the iTouch makes for a great mobile business card. An incident Tuesday at St. Johns University in Queens has revitalized 3Dwalkthroughs.com‘s efforts towards finding ways to utilize our technology to make students and emergency first responders more aware of their surroundings during a crisis situation. While watching news coverage of the event unfolding at St. Johns, I learned of a company called Mir3. One of Mir3’s products, inCampusAlert, successfully sent text messages to students at St. Johns informing them of Tuesday’s crisis in real time. It is becoming apparent to me that all of the technologies that can make a difference in terms of the safety of students and emergency first responders already exists today. The challenge is making all of these technologies work together. Examples of these technologies include: Text Messaging, GPS Technology, 3D Walkthroughs, 360 Degree Real Time Camera’s, Mobile Phones’s Supporting Video, etc. One of our ideas includes a secured real time broadcast which launches during an emergency and is sent to specific mobile devices. The broadcast would include a realistic 3D Walkthrough of the entire location, use GPS technology to show a person exactly where they are within the facility, and make suggestions as to the best way to find an exit. We are actively looking for partners to help us devlelop this product. NY Times Launches Mobile Real Estate Services – 3D Walkthroughs To Go? The New York Times has recently launched a new service that provides access to real estate listings directly from a mobile device. The service offers the ability for anyone to search for properties by entering specific property criteria (such as location, price or listing ID), send the property information to a friend’s mobile phone or link to a mobile Web page containing full information and photos (if available). As mobile phone technology continues to improve, 3Dwalkthroughs.com believes the media platforms supported by mobile devices will expand. For example it is probably just a matter of time before you can send a friend a link to a 3D Walkthrough or 3D Rendering to be viewed directly from a phone. Some of the newer mobile devices such as the Iphone will also allow people to experience interactive capabilities of products such as our Interactive 3D Floor Plans or 3D Walkthroughs. The launch of the NY Times mobile service validates the importance of catering to a mobile market. From your mobile phone you can go to http://mobile.nytimes.com/realestate (or http://m.nytimes.com/re ). From there you can search for a real estate listing, either by typing in the listing ID or by selecting search criteria such as location, price, number of bedrooms or specifying only new listings or listings with open houses. You may receive up to 200 listings at a time, displayed 10 per page. Click “Next” or select a page number to access the next set of listings or click “modify search” to narrow your search criteria and results. Researchers at IBM announced a prototype visualization software that allows doctors to interact with the medical data of a patient by using a 3D modeled avatar containing all the patients records. The technology named the Anatomic and Symbolic Mapper Engine (ASME)allows a doctor to click on a particular part of the avatar “body” and search a database of medical records to retrieve relevant information. An example of this technology in action would be for a doctor to click on the spine of the avatar and instantly see all the available medical history and information related to that patient’s spine, including text entries, lab results and medical images. If the doctor is interested in additional information related to a specific part of the spine, the doctor can zoom in, narrowing the search parameters by time or other factors. One of the main challenges in the early adoption of this technology is the sharing of information among hospitals, clinics and other providers in a way that protects individual patient privacy. 3Dwalkthroughs.com envisions a future where this technology will evolve to a doctor treating a patient from a remote location through an avatar that links the patients real time condition to the doctor’s computer. You are currently browsing the 3D Walkthroughs blog archives for September, 2007.